Cylon Toaster, Frak. | OhGizmo! So what do you do when a show nicknames a robotic species a toaster? You take a regular toaster and modify it and sell it for $65. 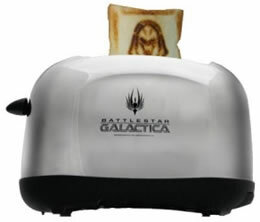 NBC/Universal has released a limited edition toaster that comes with the Battlestar Galactica logo on the side and imprints an image of a Cylon centurion on the toast. The toaster was made for the San Diego Comic-Con but is also being sold online. The NBC site states that only one production run of the toaster will occur. If no one’s the wiser you might get away with selling the miraculous toasted image on ebay for thousands of dollars, or maybe learn what a holding cell looks like. At least you can help the war effort by eating the heads of Cylons each morning. Sold out in 3.. 2.. 1… now.